This 5 Minute Fluffy Yogurt Fruit Salad is usually my go-to side dish on busy nights. It is so easy to make, it literally takes five minutes to make. It's also a favorite with my kids. Tastes like dessert. When the temperatures start to climb, my desire to spend time in a hot kitchen baking food is non-existent. Unfortunately, my family still wants to eat (ha ha), so I try to find recipes that can be made in as little time as possible. When I say that this recipe takes five minutes to throw together, I really am not kidding. It’s the perfect side dish to any meal and is always a hit at potlucks. Everyone LOVES this recipe. It is so delicious. It could practically be a dessert it is so tasty. Your family and friends are going to love this one. It is the BEST fruit salad, I have tried in a while. Step 1: Dump your yogurt into a bowl. Step 2: Fold in the container of Cool Whip. Step 4: Add marshmallows and fruit. (If you use canned fruit, be sure to drain it). *We also love to use strawberry yogurt and add some fresh strawberries. 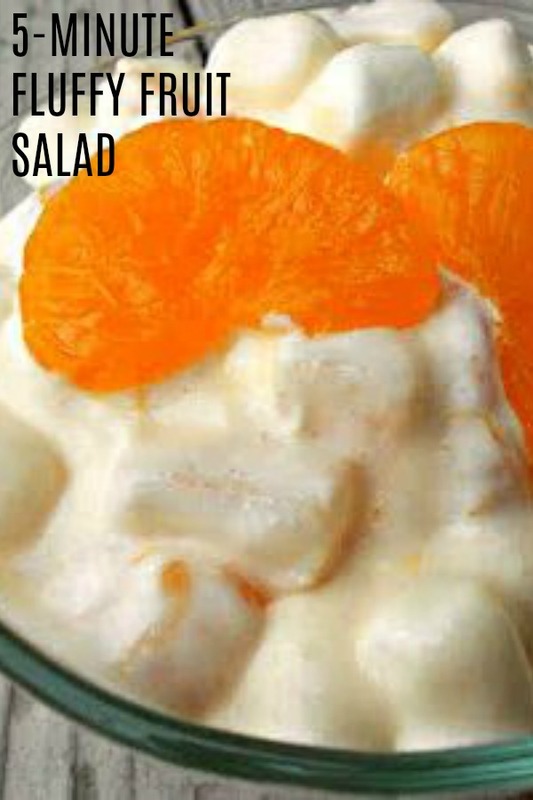 *If you use canned fruit, make sure you drain it VERY well or it will make your salad runny. You may also want to dry your pre-washed fresh fruit with a paper towel as well. Homemade whipped cream is my jam. It tastes so amazing. I however, usually buy mine from a container on the freezer aisle at the grocery store. I prefer the homemade stuff, but I am a busy mom and if I can save myself a little time, I will. However, I do feel like the homemade stuff is little better, because I can see what it is, exactly, that I am eating. Step 1: Prepare a cold bowl and metal whisk. (I just put mine in the freezer for about 20 minutes). Step 2: Combine about 2 Tablespoons of sugar and 1 cup of heavy whipping cream in the bowl. Step 3: Using a hand mixer, whip and combine until the whipped cream creates peaks. Step 4: Store in fridge until ready to serve. I would use and serve within the same day of making. Did you know we have a Youtube Channel? We have hundreds of simple and delicious recipes, your family will love. Each recipe is tried and true, so you know your family will like it. looking for more delicious side dish recipes? Dump your yogurt into a bowl. Fold in the container of Cool Whip. Mix well. Add marshmallows and fruit. Chill and serve! *If you use canned fruit, make sure you drain it VERY well or it will make your salad runny. I have a recipe very similar to this but without the yogurt. I'm going to try this. Thanks for sharing and enjoy your weekend. I need to make this...I would love it but my kids would really flip for it! This looks like it would just hit the spot!! Thanks for the recipe :) Pinned! Orange creme yogurt is heaven on earth..... nuff said! Made it just like the recipe above, added a little toasted coconut to the top. Yes! Just like it says in the instructions, you will want to make sure that the fruit is very drained if you use canned fruit or it turns out kind of runny! I want to try this for our Garden Club potluck. Can I make it the evening before if I drain the fruit really well? It may get a little runny made the night before. You could always drain off any excess liquid. The good part about this recipe is prep time is only about 5 minutes.